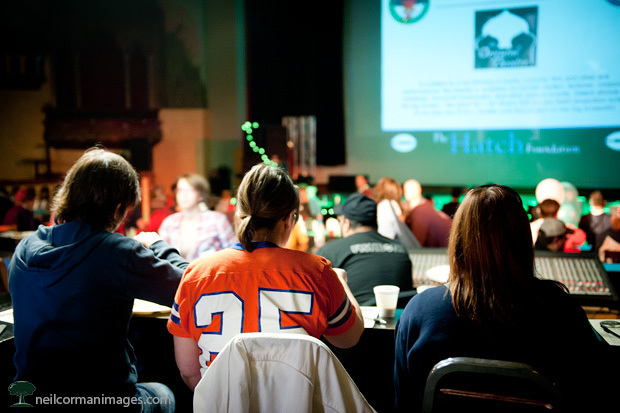 Just about a year ago, The Hatch Foundation hosted The 6th Annual Meanest Chili Cook-Off which I photographed for them at The Oriental Theater. During the event, thirteen different chili’s were tasted with some gluten free and a vegetarian option in the mix. The results were quite close, and in the end there was a tie for the winning chili this year. The event raised money for The Fisher House, which provides a home away from home for our veterans, active military and their families. The 7th Annual Meanest Chili Cook-Off happens this coming Sunday, November 4th at the Oriental Theater. Thank you to those who stopped by my booth at the Colorado Artfest at Castle Rock over the weekend. It was nice to discuss the work with you and answer the questions which you had as well during the two days. If there was an item which you did not get a chance to purchase during the festival this weekend, you may place an order online. Now through Monday September 17th, you may use the coupon code CASTLEROCK on the shopping cart page prior to checkout for free shipping on all orders within the United States. Please keep in mind today is also the final day for summer pricing on holiday cards as well. This final art festival I will be showing my work this year is the 23rd Annual Colorado ArtFest at Castle Rock this coming weekend. The above image of the Denver at sunrise will be one of the images on display in my booth and for this show it is printed 25″ x 60″, mounted and framed. At the earlier festivals, this has drawn attention to the booth and received a great response. You may find my booth (number 130) in the southwest area of the parking lot near the Castle Rock library. The festival is on Saturday (September 8th) from 9:00 A.M. – 6:00 P.M. and Sunday (September 9th) from 9:00 A.M. – 5:00 P.M. There is a $5 charge to attend this festival which has over 150 artists. Thank you to those who stopped by my booth at the Golden Fine Arts Festival over the weekend. It was nice to discuss the work with you and answer the questions which you had as well during the two days in the first state capitol of Colorado. If there was an item which you did not get a chance to purchase during the festival this weekend, you may place an order online. Now through Monday August 27th, you may use the coupon code GOLDEN on the shopping cart page prior to checkout for free shipping on all orders within the United States. This year I will be showing my work at the Golden Fine Arts Festival which takes place in historic downtown Golden. The above image of the Denver at sunrise will be one of the images on display in my booth and for this show it is printed 25″ x 60″, mounted and framed. You may find my booth (number 22) on 11th Street just east of Cheyenne Street. The festival is on Saturday (August 18th) and Sunday (August 19th) from 10:00 A.M. – 5:00 P.M.
Once again this year I will be showing my work at the Boulder OpenArts Festival which is located on the Pearl Street Mall. The above image of the Denver at sunrise will be one of the images on display in my booth and for this show it is printed 25″ x 60″, mounted and framed. You may find my booth (number 1406) near the Cheesecake Factory which is at 14th and Pearl. The festival is on Saturday (July 21st) from 10:00 A.M. – 8:00 P.M. and on Sunday (July 22nd) from 10:00 A.M. – 5:00 P.M.
MODesTEA will be showing the “Tennyson Streetscape” photography which I photographed last summer. The images will be on the walls during the month of May, but also as the street celebrates the outdoor art ribbon cutting and the completion of the project on Friday May 4th. 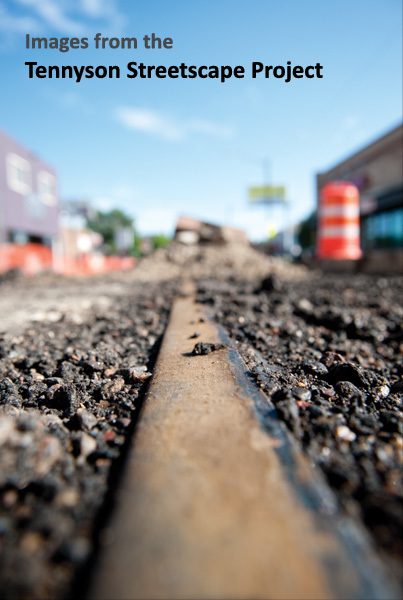 Some of the pieces come with a piece of history which are the original track spikes and soil. MODesTEA is located on 43rd Street just steps west of Tennyson Street in the Berkeley District of Northwest Denver. Once again this summer I will be taking part in a few art festivals around the Metro Denver area. I hope that you will be able to stop by and visit me at one or all of the shows and also check out some of the new work on display. A few weeks ago, I walked past Union Station in downtown Denver. 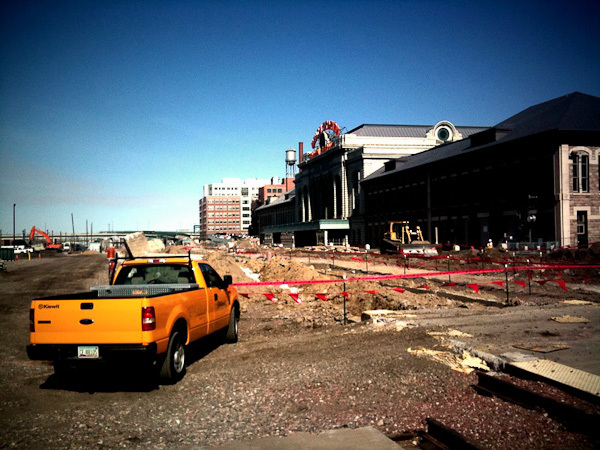 The area around Union Station is in the midst of a huge construction project as it changes to a regional transportation hub for the Denver area. You may recall just over a year ago, I captured the following image of Union Station during a spring snow storm. A year later this is how the scene has changed, of course the snow is not the only difference. 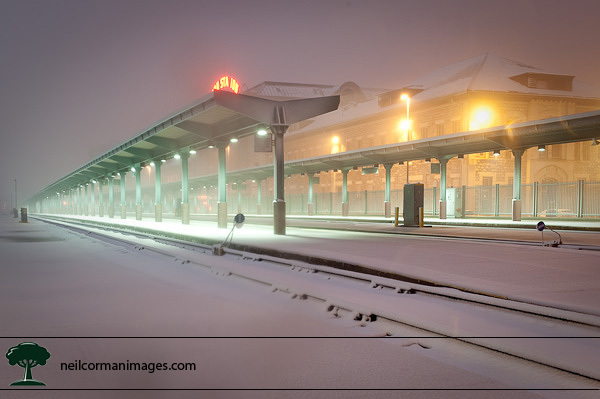 The image Union Station Snow has been on display in a few shows the past year on Saturday April 16th it will be displayed in the Lone Tree Photographic Art Show. 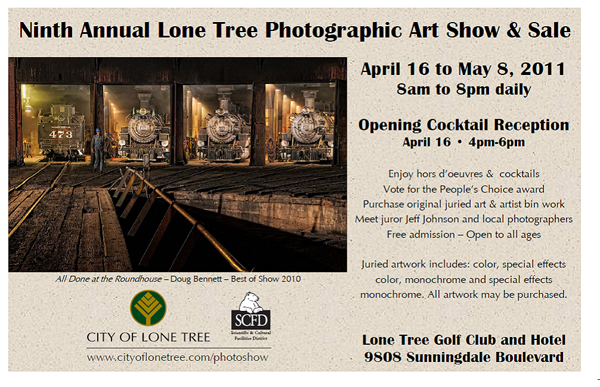 The show runs through May 8th at the Lone Tree Golf Club and Hotel. I will be in attendance on Saturday, and hope to see you there. 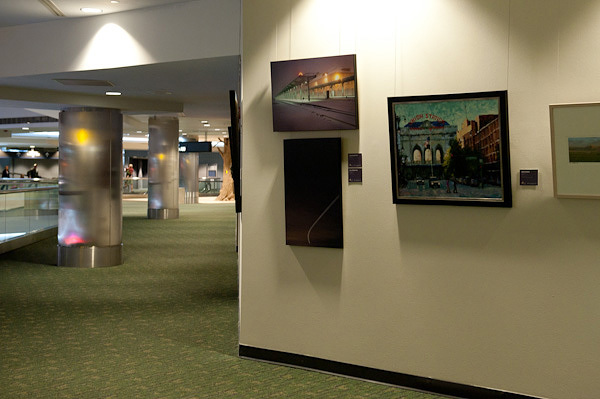 As part of the Creative Capitol exhibition program, I will have artwork on display at Denver International Airport through the end of February. The exhibit includes 79 artists showing around 100 pieces in all mediums. 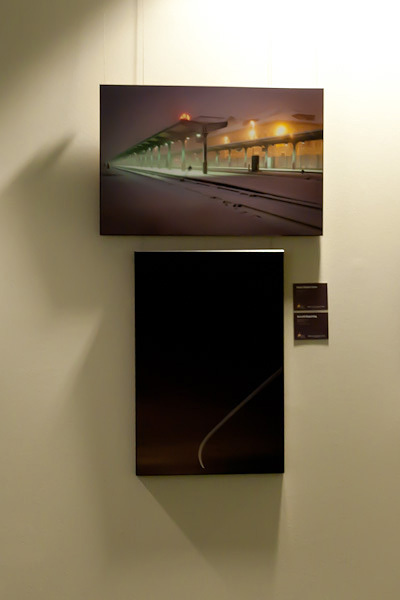 My work which was selected are Aircraft Departing and Union Station Snow. During the Thanksgiving weekend I was able to see the display, which is on Concourse A (inside security). The two pieces may be found at the northwest portion of the mezzanine level. If you are traveling through the airport between now and the end of February, snap a picture of the artwork and e-mail it to me. By doing so you will be entered to win a 8×10 matted print of one of the two pieces.